William Clarkson was born 26 March 1859 at Whitby, Yorkshire, England. Educated at a private school in Whitby, he was articled to the shipbuilding firm of R & W Hawthorn of Newcastle-upon-Tyne and later worked there as a marine engineer. In May 1884 Clarkson joined the South Australian Naval Service as an Engineer Lieutenant, coming to the colony in HMCS Protector. On 24 August 1887 he married Louisa Clarissa Hawker at Christ Church, Adelaide. Serving under Captain WR Creswell, he shared his enthusiasm for the development of an Australian naval force. Clarkson was a staff engineer aboard Protector during the Boxer Rebellion in 1900-01, before transferring to the Commonwealth Naval Forces (CNF) upon Federation. He was promoted to Engineer Commander in October 1905 and two years later visited Japan, the USA and the UK to study naval dockyards and ship construction. He remained in the UK in 1908-11 overseeing the construction of destroyers for the CNF. Clarkson was promoted to Engineer Captain in July 1910 and, upon the establishment of the Royal Australian Navy in 1911, was appointed Third Naval Member of the Australian Naval Board, a post he held until his retirement in 1923. He was responsible for the construction and engineering of ships, for ships' repairs, and for control of naval dockyards and bases. In 1913 he was appointed CMG and on the outbreak of World War I became controller of shipping for Australia as well as director of transports. 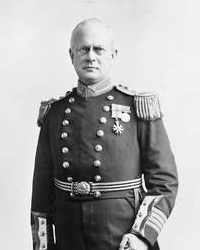 He was promoted to Engineer Rear Admiral in 1916 and appointed KBE in 1918. That year he was appointed chairman and controller of the Interstate Central Committee to operate coastal shipping requisitioned for Imperial service. The royal commission on navy and defence administration in 1918 lamented the effect on Clarkson’s naval duties of the many other activities with which he was entrusted, yet recommended that in a reconstituted Naval Board he be appointed business member with wider naval responsibility. Cabinet later refused to accept the commission's recommendation so that he could concentrate solely on his naval duties. In 1919-22, under Clarkson’s guidance, the RAN developed a modernisation programme, including construction of ships, submarines and a fleet air arm. He was promoted to Engineer Vice Admiral in November 1922 and transferred to the retired list. On the formation of the Commonwealth Shipping Board in August 1923, he was appointed chairman, serving until 1927. Clarkson died at his home in Darling Point, Sydney, on 21 January 1934 and was survived by his wife and two sons. Edited from the Australian Dictionary of Biography entry by BN Primrose.